~4-5 month supply. 2 oz. REMOVES DIRT AND OIL FROM DEEP IN THE PORES. 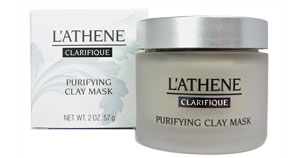 Natural soft mineral clays of Kaolin and Bentonite purify, detoxify and lift impurities from deep within the pores. High concentrations of minerals make these pure clays highly absorbent resulting in effective removal of deeply embedded dirt, dead cells and oil. Powerful Peppermint Oil decreases inflammation and stimulates facial circulation, while Tea Tree and Clove Oil penetrate and help to kill bacteria deep down. Active astringent and antiseptic properties. Helps improve the look of enlarged pores and leaves skin with a healthy, youthful glow. FOR COMBINATION / T-ZONE SKIN: Use 1 time/wk on full face and 2-4 times/wk on T-zone. Leave on 20-40 min. As skin gets healthier, do full face 1 time/wk and T-zone 1-2 times/wk. FOR OILY SKIN: Use 3-5 times/wk. Leave on for 20-40 min. As skin gets healthier and oil lessens, can cut back to 2-3 times/wk. Very oily skin, sleep in mask 2 times/wk for first week or two. FOR NORMAL SKIN: Use 1 time/wk on full face for 5-10 min. FOR BREAKOUTS: Spot mask on breakouts and sleep in it. Up to every other night. FOR DRY SKIN: Twice a month for 5 minutes for deep pore cleansing. FOR ROSACEA-LIKE DRY: Use as a scrub every other week as needed. Do not let dry. FOR ROSACEA-LIKE OILY: Start out 1-2 min. See how skin tolerates. Increase up to 10-15 minutes max 2 times/wk as needed. The same pollutants that deplete our environment also affect our skin. Every day our skin is exposed to environmental toxins. Pores get clogged with harmful by-products of modern life which increase fine lines and wrinkles, diminishes hydration and diminishes elasticity. Regular cleansing isn’t enough to eliminate deep down impurities that accumulate over time. The look of the pores can be enlarged with deep impurities. A mask is critical to remove dead cells and dirt that can accumulate in pores, therefore making them look smaller. Toners for anti-aging skin can be a leading cause of dryness and dehydration of skin. Most toners contain alcohols and harsh drying agents. These can strip and disrupt the skin's acid mantle which can cause dryness and itching. Blackheads and whiteheads cannot be broken down by toners. Natural mineral clays neutralize these toxins to help repair damage, and promote newer, firmer looking skin. Clay has been used for medicinal and cosmetic purposes for skin throughout history from the Egyptians to Native Indians. Clay is the single most used health remedy in France today. Kaolin and Bentonite clays have high concentrations of minerals. This makes them highly absorbent resulting in deep removal of impurities and dead accumulated cells plus deep removal of excess oils (lipids). These clays intensely purify, stimulate and invigorate skin. They infuse your skin with essential minerals to keep it hydrated and radiant.